[20. 12. 2017] The newest issue of AGF EuropaNews provides information about social and family policy related news from Europe and the European Union for the month of December 2017. It also comprises references to studies, reports and upcoming events. Unfortunately, AGF EuropaNews is only available in German. ... more on " EuropaNews December 2017"
[01. 12. 2017] The “Bundesforum Familie” is a network of 120 organisations that are committed to continuous cooperation and a comprehensive dialogue supporting family concerns. On 30 Nov. the network members gathered together to reflect the discussions of the past two years, decide on a new advisory board and on the topic of 2018/19. ... more on "General Assembly "Bundesforum Familie""
[30. 11. 2017] The November 2017 issue of AGF EuropaNews was published today. As usual, you will find the most important developments concerning family policy at the European level and from the European states. You will also find links to reports and studies as well as to a variety ofinteresting upcoming events. Unfortunately, AGF EuropaNews is only available in German. ... more on "EuropaNews November 2017"
[30. 10. 2017] The newest issue of AGF EuropaNews provides information about family policy related news from Europe and the European Union for the month of October 2017. It also comprises references to studies, reports and upcoming events. Unfortunately, AGF EuropaNews is only available in German. ... more on "EuropaNews October 2017"
[20. 10. 2017] On wednesday, the 18 October, the familiy organisations invited to a conference about the ongoing digital changes in the working environment. Under the titel "Brave new world of work? Ideas for a stronger family perspective in the digital work 4.0" participants and experts from politics, academics and organisations, discussed about risks and chances particularly for families. ... more on "AGF Conference: Families in the digital Work"
[29. 9. 2017] Today, the September 2017 issue of AGF EuropaNews was published. As usual, you will find the most important developments concerning family policy at the European level and from the European states. It also provides you with links to reports and studies as well as interesting upcoming events. Unfortunately, AGF EuropaNews is only available in German. ... more on "EuropaNews September 2017"
[24. 09. 2017] The German World Children's Day Festival took place last Sunday, at Potsdamer Platz, in Berlin. Just like in the past years, AGF presented its members and invited families to a crash course in speed stacking and a "course of senses" and informed about the work of the family organsations. ... more on "AGF at World Children's Day Festival "
[31. 8. 2017] The newest issue of AGF EuropaNews was published today. As usual, you will find the most important developments concerning family policy at the European level and from the European states. You will also find links to reports and studies as well as to a variety ofinteresting upcoming events. Unfortunately, AGF EuropaNews is only available in German. ... more on "EuropaNews August 2017"
[29. 8. 2017] In regard of the 10th anniversary of the so called 'Krippengipfel' from 2007, which led to an entitlement for children under three years to attend a kindergarten, and in combination with the current Ländermonitor of the Bertelsmann-Foundation, the family organisations emphasize the need of a high quality in early childhood education and care and therefore advocate common binding standards. ... more on "AGF family organisations for a better quality in kindergartens"
[31. 7. 2017] The July 2017 issue of AGF EuropaNews was published today. As usual, it provides you with information about the most important developments concerning family and social policy at the European level and in the European states. You will also find links to reports and studies as well as interesting upcoming events. Unfortunately, AGF EuropaNews is only available in German. ... more on "EuropaNews July 2017"
[4. 7. 2017] Yesterday, on 3 July, AGF carried out an European Expert meeting on digitalization and family. Around 30 participants from Germany and other European countries discussed the question: "Growing up digital – How can we make the internet safe for children and young people?" ... more on "European Expert meeting on digitalization"
[30. 6. 2017] Today, the June 2017 issue of AGF EuropaNews was published. As usual, you will find the most important developments concerning family policy at the European level and from the European states. It also provides you with links to reports and studies as well as interesting upcoming events. Unfortunately, AGF EuropaNews is only available in German. ... more on "EuropaNews June 2017"
[28. 6. 2017] Today the Fifth Report on Poverty and Wealth in Germany is presented and discussed in the German Bundestag. Against that background, the family organsation represented by AGF appeal to make the fight against child poverty a first order task, which also finds its way into the next coalition agreement and therefore has to be consequently followed in the next legislative term. ... more on "Family organisations on fifth Report on Poverty and Wealth: Fighting child poverty is a first order task"
[2. 6. 2017] In regard of todays debate in the Bundestag about the Fifth Report on Poverty and Wealth in Germany, AGF and Deutsches Kinderhilfswerk point out the necessity of a comprehensive action plan against child poverty, combining the forces of all relevant ministries. In a letter to the chairs of the parties and groups represented in Bundestag as well as to the Federal Minister for Social Affairs, Andrea Nahles and the Federal Minister for Families, Manuela Schwesig, both organisations call for urgent action to address child poverty and put it on first place on the political agenda, even after the up-coming elections in September. ... more on "Fighting child poverty with a general action plan"
[31. 5. 2017] The May issue of AGF EuropaNews provides information about recent family policy related news from Europe and the European Union. It also comprises references to studies, reports and upcoming events. Unfortunately, AGF EuropaNews is only available in German. ... more on "EuropaNews May 2017"
Refugees must have a right to family reunification! [28. 4. 2017] The General Assembly of AGF appeals to the German Bundestag to take care of the unity of the family also for refugees. Regarding its plenary session, at which such a proposal of the opposition parties was said to be discussed, the family organisations of AGF called for a rollback of the given limits for family reunification for people having only a subsidiary status. ... more on "Refugees must have a right to family reunification!" [27. 4. 2017] On April 26th, the European Comission has issued its long-awaited Reconciliation Package. Read about this and other news from the European level in our latest issue of AGF EuropaNews. It also provides you with links to reports and studies as well as interesting upcoming events. Unfortunately, AGF EuropaNews is only available in German. ... more on "EuropaNews April 2017"
[31. 3. 2017] With this series AGF makes a stocktaking of the current system to secure a subsistance level for children in Germany. The first part of the series on the subsistance level for children in the German social law was published today and is available as pdf. 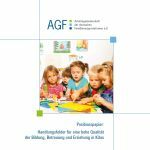 ... more on "AGF starts series of publications on the German subsistence level for children"
[31. 3. 2017] Today, the March 2017 issue of AGF EuropaNews was published. As usual, it provides you with news about the most important developments concerning family policy at the European level and from the European states. You will also find links to reports and studies as well as interesting upcoming events. Unfortunately, EuropaNews is only available in German. ... more on "EuropaNews March 2017"
[30. 3. 2017] The German parliament (Bundestag) has adopted the reform of the national maternity law. The revised maternity law now includes students and self-employed women and also aims to give more decision options to the pregnant and nursing women instead of a general employment ban. On this occasion, AGF recalls its statement on the initial draft law. The statement makes a differentiated approach on the challenge to balance the freedom of the pregnant and nursing women on one side and potential pressure that companies might put on these women. ... more on "Reform of maternity law"
[28. 3. 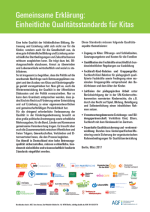 2017] On occasion of the 2017 German Child and Youth Welfare Congress 27 welfare, children rights, social and familiy organisations as well as trade unions jointly call for mandatory, nationwide consistent and scientificly sound standards in child care facilities. The organisations welcome the results that have been made by the state and federal states and assume, that even in this legislative period mandatory measures will be compiled, which take up on the existing processes in the federal states. The aim is to ensure a high quality in child care facilities all over Germany in foreseeable future. concerning family policy at the European level and from the European states. It also provides you with links to reports and studies as well as interesting upcoming events. Unfortunately, AGF EuropaNews is only available in German. ... more on "EuropaNews February 2017"
[14. 2. 2017] The family organizations along with nine organizations support the legislative proposal by the German Ministry of Labour, which aims to give a possibility to employees to limit the time period they work in part-time. ... more on "Joint declaration by ten organisations on right to limit part-time work"
[31. 1. 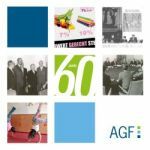 2017] 2017's first issue of AGF EuropaNews as usual contains an overview of recent developments concerning family and social policy, both on EU level and in the European states. It also covers interesting reports and studies as well as upcoming events. Unfortunately, EuropaNews is only available in German. ... more on "EuropaNews January 2017"
[19. 1. 2017] The family organisations of AGF ask for a possibility for employees, that eases their way back to full time after they had reduced their working hours. On occasion of the current data of the German statistic agency on working hours and individual working hour preference, the organisations support the legislative initiative of ferderal minister Andrea Nahles to limit the duration of part-time work if the employee wishes to do so. ... more on "Right of return from part-time up to the original working time"
[10. 1. 2017] On 10 January, Federal President Joachim Gauck invited to the traditional New Year's Reception at Schloss Bellevue. Stefan Becker,newly elected chairman of the AGF, was among his guests as representative of the family organisations. ... more on "Stefan Becker at New Year's Reception of the Federal President"
[3. 1. 2017] Stefan Becker is new chairman of AGF. As scheduled, the general leadership of AGF is exchanged on rotation between the members of AGF. After two years the evangelische arbeitsgemeinschaft familie (eaf) has given over to the "Familienbund der Katholiken" (FDK). President of FDK is Stefan Becker, who, therefore, has taken over chairmanship of AGF from Christel Riemann-Hanewinckel, president of eaf. She will remain vice-chairwoman. ... more on "Stefan Becker new chairman of AGF"